Here are 3 free Chrome extensions to set custom zoom level in Chrome. 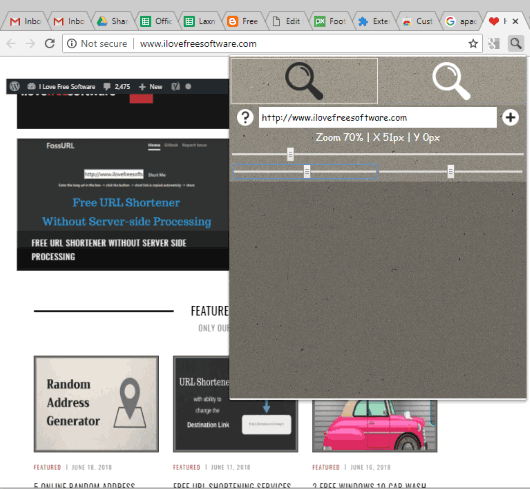 The native zoom in/out feature of Chrome is good but there are preset zoom levels (25, 33, 50, 67, 75, 80, 90, and 100) only. Therefore, these Chrome extensions are handy. These extensions help you set any zoom level, say 17, 66, 23, for a tab or webpage. So, the control for zoom level will remain in your hands only. The zoom percentage is reset to default level when you relaunch Chrome browser. Thus, the extensions will help you for the current session only and everything will be back to default mode. Some of these custom zoom level for Chrome extensions also bring many other interesting features. For example, you can change zoom level beyond 100%, see current zoom level on extension icon or badge, set minimum zoom level to 1%, etc. 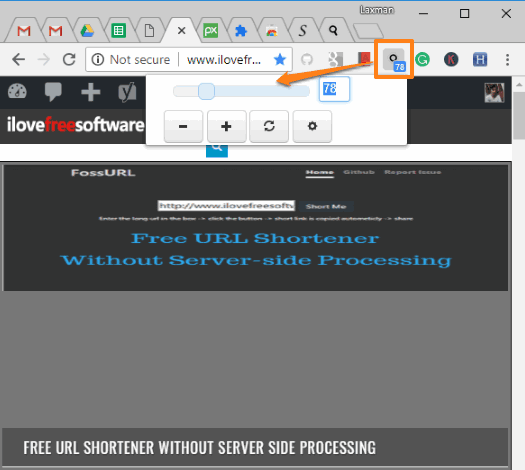 Let’s check these free extensions to set current zoom level in Chrome browser. Zoom (Homepage) is one of my favorite extensions to set custom zoom level in Chrome. This extension lets you change zoom level with the help of a slider or by entering zoom level value manually using its icon. The slider isn’t so helpful as you need to adjust it carefully. So the best option to set custom zoom level is enter the value manually. 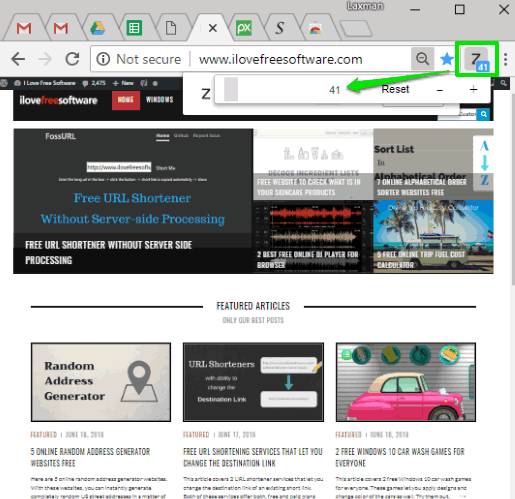 One unique feature that I find very interesting is you can change only font zoom level (or size) of a webpage and not the entire webpage using this extension. So the webpage will remain with the default zoom level and only font size will increase/decrease based on the zoom level set by you. Apart from using its icon to set custom zoom level in Chrome, it also provides right-click context menu that you can enable using Options of this extension. That menu provides preset zoom levels, from 200% to 10%, with 2% gap (or zoom steps) between each zoom level. You can also access Options of this extension to enable other interesting features. For example, you can show current zoom level on the extension icon, change background badge color, set zoom steps for the next value, choose default zoom level for all screen sizes or a particular screen resolution, and more. This is a fantastic extension which gives a strong competition to rest of the custom zoom level extensions covered here. EZ Zoom (Homepage) is another great custom zoom level Chrome extension. Its slider is a bit better than “Zoom” extension mentioned above. So setting a particular zoom level becomes easy. If you still find adjusting the slider not so convenient, then you can also enter zoom level value by yourself. Its icon or badge is used to access zoom level slider and box to enter zoom value. Before using this extension directly, you should access Options of this extension so that you can set zoom steps to “1“. If zoom steps are set to say 4, 5, or some other values, then slider won’t work the way it should work. Therefore, it is good to set zoom steps to value 1. The options page of this extension also helps to set default zoom size, minimum (1%) and maximum zoom size. I’m not sure about maximum zoom level but I tried it up to 5000% and it worked great. Custom Page Zoom (Homepage) is also an interesting Chrome extension. It lets you set custom zoom level for separate websites or all websites. You can add websites to zoom level list and then set their zoom levels. If you don’t want to do that, then simply use the extension badge to set custom zoom level for currently active tab. Use the slider to set zoom level of your choice. It also comes with one unique feature. You can set position of webpage after setting the custom zoom level. You can move it to top left side or bottom part on the current tab. Use the available sliders to set webpage position. We have also covered a tutorial to set default zoom level in Chrome. I need to set custom zoom level in Chrome a few times a day. Thankfully, these 3 extensions exist for that purpose. All these extensions are pretty good. Still, for me, “Zoom“, the very first extension is most useful. The reason is it helps to set custom zoom level using slider as well as with manual entry. Also, its feature to change zoom level for webpage font only makes it more useful.